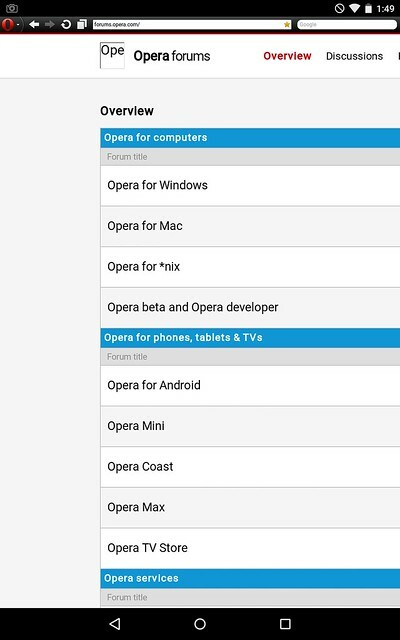 Which version of Opera are we talking about? Can you give me some more hints please. How many saved pages do you have, how do you measure the size of the data files etc? I can definitely not reproduce this on my own phone so it may be device specific. Can you list the pages you've saved... perhaps it's related to one of them? Mr Emoller, I hv many saved pages, and if u go to the data/data section of ur phone, u would see the folder, com.opera.browser, then open the app_ooera folder and u would see saved pages folder u would see the opera data or go to ur apllication manager and u will see the opera data. I cant list the pages that I have saved cos I can no longer acess the opera browser. I have 217 saved pages which is 435.23mb I wish you guys made it poss5to attach pictures here and I will show you screenshots. Pictures work fine here - but they must be hosted somewhere else, they have no storage allocated for forum members. There are lots of image hosting services available - upload your images somewhere then use them in your post.